How does the brain work? We have no idea. We are still in the very beginning stages of understanding most of the basics. From a researcher's perspective, it's a very exciting time to be a scientist, because you get to rummage around on the ground floor. But from an overall perspective, most of it is spooky. Let me give you some examples of how little we know about how the brain works. We know that you use the left-side of your brain for speech. Under normal circumstances, if you get a stroke on the left side of your brain, your speech can be greatly affected. Depending upon where you got the stroke, it could affect your ability to speak language or your ability to understand language. There is a little six year old who suffered from something Sturge-Weber syndrome, a catastrophic brain disease. Because he had this disorder, the little guy had to have his entire left hemisphere removed. No left hemisphere, no language. That should have completely destroyed his language ability. Right? Within two years, the little guy had regained his language abilities entirely. The right side of his brain seemed to have noticed there was a deficit and simply rewired itself to take over talking. Do we understand this? We do not understand how you learn a language of any kind. We don't know how you know how to walk. We don't know how you know how to read. You have a complete map of your body in your head. Actually, you have several maps of your body in your head. Some of them tell you where you are, some of them tell you how to move. One even tells you how to see. We don't know how they coordinate their information. We don't know how it knows its you - and what, if anything, YOU are. Consciousness remains a slippery fish as ever. So you ask me how the brain works. I am happy to repeat my answer. We have no idea. Marvel at the neuroscientific reasons why smart teens make dumb decisions! Behold the mind-controlling power of executive function! Thrill to a vision of a better school for the teenage brain! 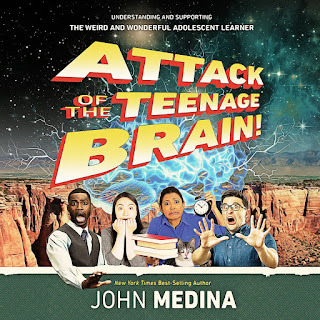 The new book, Attack of the Teenage Brain, is an enlightening and entertaining listen that will change the way you think about teen behavior and prompt you to consider how else parents, educators, and policymakers might collaborate to help our challenging, sometimes infuriating, often weird, and genuinely wonderful kids become more successful learners, in school and beyond. The smell of my mother’s beef stew simmering in the kitchen on a cold winter’s day is easily the best comfort-food memory I have. Mom’s stew was like a warm hug in a bowl. She once marched me into the kitchen to teach me how to make her famous beef stew. No easy task as she had the annoying habit of changing the recipe almost every time she made it. “It depends on who’s coming over for dinner,” Mom would explain, “or whatever we have lying around the house.” According to her, only two elements were critical to pull off her masterpiece: the quality of the beef and the gravy surrounding the meat. Like Mom’s stew, human intelligence has two essential components, both fundamentally linked to our evolutionary need to survive. In other words, we as humans have the ability to learn rapidly from our mistakes and the ability to apply that learning in unique combinations to our ever-changing world. Intelligence, seen through this evolutionary lens, is simply the ability to do these activities better than someone else. This is one of my favorite examples of an infant’s penchant for exploration. I was attending the Presbyterian baptism of a 9-month-old. Things started out well enough. The infant was nestled quietly in his dad’s arms, but as the parents turned to face the pastor, the baby spied the handheld microphone. He quickly tried to wrest the mike out of the pastor’s grip, flicking his tongue out at the ball of the microphone. The little guy seemed to think that the mike was some kind of ice cream cone, and he decided to test his hypothesis. Thousands of experiments confirm that babies learn about their environment through a series of increasingly self-corrected ideas. They use fluid intelligence to extract information, then crystallize it into memory. Nobody teaches infants how to do this, yet they do it all over the world. They are scientists, and their laboratory is the whole world. An unquenchable desire to tinker and experiment. The biggest common denominator of these characteristics? A willingness to explore. The biggest enemy was the non-exploration-oriented system in which the innovators often found themselves. A healthy, well-adjusted preschooler sits down at a table in front of two giant, freshly baked chocolate-chip cookies. It’s not a kitchen table—it’s Walter Mischel’s Stanford lab during the late 1960s. The smell is heavenly. The child nods. The researcher leaves. What does the child do? If the children are kindergartners, 72 percent cave in and gobble up the cookie. If they’re in fourth grade, however, only 49 percent yield to the temptation. By sixth grade, the number is 38 percent, about half the rate of the preschoolers. Welcome to the interesting world of impulse control. It is part of a suite of behaviors under the collective term “executive function.” Executive function controls planning, foresight, problem solving, and goal setting. Mischel and his many colleagues discovered that a child’s executive function is a critical component of intellectual prowess. Why? Executive function relies on a child’s ability to filter out distracting (in this case, tempting) thoughts, which is critical in environments that are oversaturated with sensory stimuli and myriad on-demand choices. That’s our world, as you have undoubtedly noticed, and it will be your children’s, too. My mother’s favorite artist in the world was Rembrandt. She was much less enamored of 20th-century art. I remember her railing about Marcel Duchamp’s Fountain—simply a urinal—being placed in the same artistic firmament as her beloved van Rijn. Toilets as art? And she hated it? For me as an 11-year-old boy, that was artistic Valhalla! I stumbled around trying to get the right answer, but made no progress. Mom interrupted. “Perhaps you would come up with something like this!” Mom revealed two prints of Picasso masterpieces: Three Musicians and Violin and Guitar. It was love at first cube. Three Musicians was a revelation to me, as was the creative mind that conceived it. Why did I think that? How does anyone recognize creativity? It is a tough question, saturated in cultural subjectivity and individual experience, as the differences between me and my mother showed. Researchers do believe that creativity has a few core components, however. These include the ability to perceive new relationships between old things, to conjure up ideas or things that do not currently exist. Creativity also must evoke emotions, positive or negative, in someone else. Something—a product, a result—has to come of the process. Can you predict creativity in kids? Psychologist Paul Torrance created a 90-minute exam called the Torrance Tests of Creative Thinking. Children might be presented with a picture of a stuffed rabbit, then told they have three minutes to improve upon the design to make it more fun to play with. They might be presented with a scribble, then told to make a narrative from it. Torrance then followed their lives into adulthood, assessing their creative output throughout: things like patents filed, books written, papers published, grants awarded, and businesses started. As a research tool, the exam has been formally evaluated many times. Though the test is not without its critics, the most amazing finding remains how well a child’s scores predict his or her future creative output. The test has been translated into 50 languages and taken by millions of people. It is the go-to standard for evaluating creativity in children. The most memorable experience in my rookie year of parenting our younger son, Noah, was the moment he said his first multi-syllable word. At the time, he possessed a particular preoccupation with sea creatures, which I blame in equal parts on Finding Nemo and National Geographic. We put pictures of sea animals on the ceiling above his changing table, including a cartoon of a giant red Pacific octopus. One morning I was busy changing his diaper, just before work. Noah suddenly stopped smiling and just stared straight at the ceiling as I cleaned him up. Slowly, deliberately, he pointed his finger upward, turned his gaze from the ceiling, looked me straight in the eye, and said in a clear voice: “Oct-o-pus.” Then he laughed out loud. He replied, “Octo, octo, octopus,” laughing now. We both chanted it. You can’t argue with the fact that verbal skills are important in human intelligence. What happened in Noah’s brain that made so many things come together at once on that changing table—or in any other child’s brain as language dawns on her like a sunrise? We don’t really know. Many theories abound about how we acquire language. At birth, your baby can distinguish between the sounds of every language that has ever been invented. Professor Patricia Kuhl, co-director of the Institute for Learning and Brain Sciences at the University of Washington, discovered this phenomenon. But by their first birthday, Kuhl found, babies can no longer distinguish between the sounds of every language on the planet...Unless they have been spoken to, in person, by someone who speaks another language. Tucked into this data is a bombshell of an idea, one with empirical support across the developmental sciences. Human learning in its most native state is primarily a relational exercise. You can literally rewire a child’s brain through exposure to relationships. Though speech is a uniquely human trait, it is nestled inside a vast world of communication behaviors, many of which are used by other animals, too. But we aren’t always communicating the same thing, as legendary dog whisperer Cesar Millan points out. Millan is a world-champion dog handler. His secret is that he thinks like a dog, not like a person, when he’s interacting with a dog. Instead, Millan says, when you meet a new dog, ignore the animal. Don’t make eye contact. Let the dog come over and inspect you, sniff you. Once the dog gives you cues that he doesn’t find you a threat then you can talk, touch, or make eye contact. When dogs attack people, they may in some cases simply be acting upon an ancient behavioral reflex involving a reaction to, of all things, somebody’s face. Extracting social information by examining the face is a powerful slice of mammalian evolutionary history. But we humans use our faces, including eye-to-eye contact, for many reasons besides communicating threats. We have the most sophisticated nonverbal message systems on the planet. From babies on up, we constantly communicate social information with our bodies in coordination with our smiles and frowns. From exploration, self-control, and creativity to verbal and nonverbal ability, it is clear that the intelligence stew has many ingredients. Standard IQ tests are not capable of measuring most of these elements, even though they play a powerful role in the future success of children. However, our survival depends on the ingredients described in my mom's stew. Learn more in John Medina's Brain Rules for Baby. 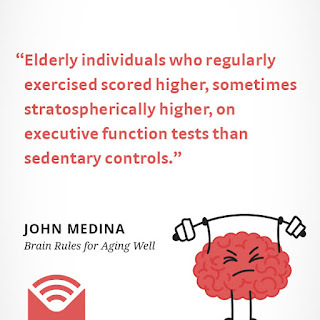 Watch John Medina explain how exercise boosts brain power. Learn more in Brain Rules and listen to a free preview of the Brain Rules for Aging Well audiobook on Libro.fm. Put the research from John Medina's Brain Rules for Baby into practice. Below, Tracy shares some tips to get you started off on the right foot. You can sign up on the Zero to Five website for more parenting tips that work. Gratitude: Being Thankful Will Help Make You Happy! Optimistic people live almost eight years longer than the glass half- empties do. Observing the megawatt power of gratitude as a practicing psychotherapist, Martin Seligman developed—and then scientifically tested— exercises centering on the ideas of thankfulness and appreciation. Watch John Medina to learn how to practice gratitude, as featured in Brain Rules for Aging Well. Learn more about the new book, Brain Rules for Aging Well. There's an obvious reason the elderly become a target: solo seniors sometimes have obese bank accounts. The less obvious reason has to do with the dark side of focusing on the positive all the time. As you age, you also become more trusting, or better to say, more gullible. We even think we know why. Watch John Medina explain. 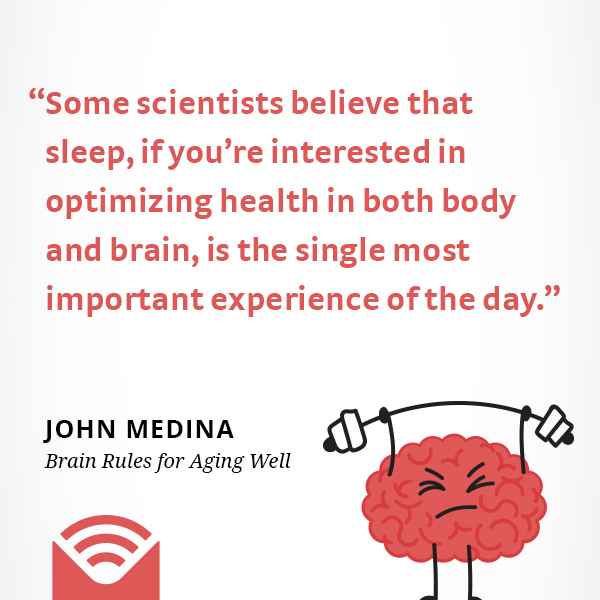 Watch John Medina share three surprises in sleep research, as discussed in the new book, Brain Rules for Aging Well. Here’s the bottom line: you need to get between six and eight hours of sleep every night, no more and no less. If you get less than six hours, mortality risk rises 21 percent in women, 26 percent in men. If you get more than eight hours, mortality risk rises 17 percent in women, 24 percent for men. You have to have the “just right” amount of sleep to optimize both quality and quantity of life. Excellent checklists have been developed over the years to help loved ones determine whether a person has Alzheimer’s or is simply guilty of being a senior. One of the best is the Alzheimer’s Association’s “10 Warning Signs of Alzheimer’s Disease,” which I'll summarize here in this video. The ten signs can be organized by topic: memory, executive function, emotions, and general processing. 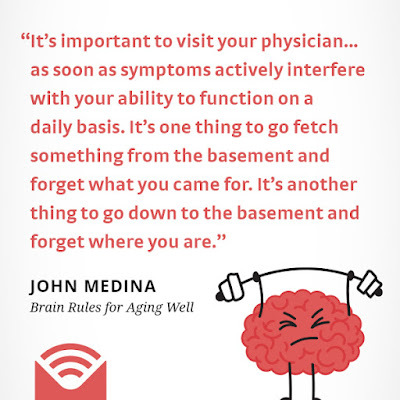 Watch John Medina introduce his new book, Brain Rules for Aging Well, in this video.